On Jan. 23, National Assembly President Juan Guaido swore himself in as Venezuela’s interim president before thousands of citizens, in an open challenge to the legitimacy of Venezuelan President Nicolas Maduro’s disastrous regime. The enduring political crisis -- with the international community split over whom to recognize as Venezuela’s legitimate leader -- has been revelatory. Arguing that the May 2018 election that handed Maduro another term was a sham, Guaido invoked a constitutional provision allowing the National Assembly president to take over for an absent or incapacitated president, while a new election is organized. Almost immediately, US President Donald Trump recognized Guaido as Venezuela’s legitimate leader, a move that could hint at the emergence of an actual Trump Doctrine. Numerous Latin American countries and regional institutions followed suit, indicating a shift away from left-wing populism in the region. As for the European Union, the response has been chaotic. Several members -- including Germany, France and the United Kingdom -- eventually recognized Guaido in a coordinated action. But others issued only statements of support, and Italy blocked a joint EU statement on the issue. This failed attempt to advance a unified policy has highlighted the dysfunction of the EU’s common foreign and security policy. The Maduro regime also has its international backers, beginning with Russia. Over the last two decades, the Kremlin has pumped billions of dollars in loans and investment into Venezuela, where public debt is estimated at over $150 billion. In 2017, the Russian state-owned energy company Rosneft took control of 49.9 percent of the US-based, Venezuela-owned refiner Citgo. Such investments have been vital to propping up Maduro’s regime. Since Guaido staked his claim, Russian President Vladimir Putin’s regime has emerged as Maduro’s foremost defender, seizing every opportunity to condemn Western-imposed “regime change.” These statements echo those made ahead of Russia’s intervention in Syria, underscoring the extent to which the Kremlin, buoyed by its success there, is doubling down on its role as global disruptor-in-chief. The Kremlin has also employed other tactics from its Syria playbook. In December, amid rising pressure on Maduro, two nuclear-capable Russian strategic bombers arrived in Venezuela on a training mission publicized by Russia’s Ministry of Defense, challenging America’s strategic dominance in the Western hemisphere. Days later, rumors emerged of Russian plans to establish a military air base in Venezuela, in what would be the largest projection of Russian military force in Latin America since the Cuban missile crisis. Russia’s activities in Venezuela are supposed to serve as a warning to the US -- and implicitly to Europe -- not to meddle in areas of Russian interest. Russia, the Kremlin wants to make clear, has the capacity to create chaos in America’s near abroad. Putin has long pushed for a return to a 19th-century model based on spheres of influence. By wielding a stick in Latin America, or at least poking a hornet’s nest, he hopes to convince his Western rivals of the desirability of such an order. Perhaps more important, he wants to show the rest of the world that the US-led order is faltering. What better way to achieve that than by challenging the oldest and most fundamental component of US foreign policy, the 1823 Monroe Doctrine? Russia’s support for Maduro, like its assistance to Syrian President Bashar al-Assad, also sends a signal to other leaders: Russia, unlike the US, is a reliable partner. Yet Russia’s disruptive power -- and loyalty to its allies -- has its limits, which are beginning to show. As the political crisis has dragged on, Russia’s support for Maduro has softened. The Kremlin now openly endorses calls for dialogue between the regime and the opposition, and there are rumors that Russian officials are quietly reaching out to Guaido and the opposition. The change in Russia’s position offers important clues about what it would take to counter its disruptive activities. The Kremlin’s resolve is weakening partly because of case-specific factors, such as the logistical challenge of carrying out any kind of military intervention so far from existing Russian military bases and infrastructure. But Russia’s commitment to Maduro is also flagging because Venezuela’s neighbors and relevant regional organizations have adopted a unified position on the issue. This stands in stark contrast to the Syrian conflict, where deep divides among Turkey, Saudi Arabia, Qatar and Iran have created plenty of opportunities for disruption. More important, many of the world’s major powers have shown far more resolve on Venezuela than they did on Syria. How can we forget US President Barack Obama’s unenforced “red lines”? In Syria, as in Ukraine, Russia filled a vacuum left by a West unwilling to act. There is no vacuum in Venezuela -- and Russia is backing down. Europe should take note. As the Syrian conflict wanes, with Assad reconsolidating his power there, Europe must be wary of further Kremlin disruption efforts. Already, Russia has established a presence in Libya, and last month, Russian Foreign Minister Sergei Lavrov visited Tunisia, Algeria and Morocco, focusing on regional conflicts, among other issues. This is not a moment to panic, but it is a moment to prepare. Europe must act now to solidify ties with regional partners and build consensus internally. Otherwise, it could find itself blindsided, yet again, and unable to counter Russian interference. 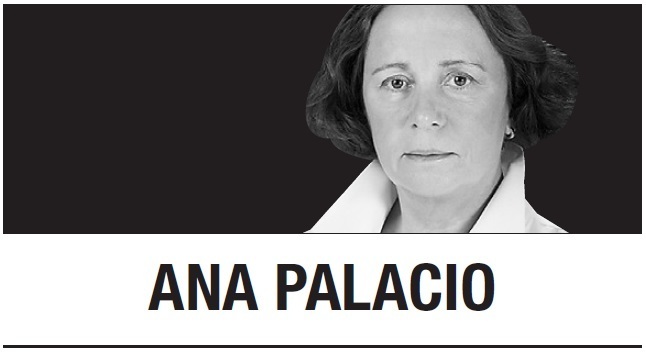 Ana Palacio is former minister of foreign affairs of Spain and former senior vice president and general counsel of the World Bank Group. She is a visiting lecturer at Georgetown University. -- Ed.